Verbal Aggression Is A Pre-bullying Behavior: What Harm Does It Do and What Can We Do About It? 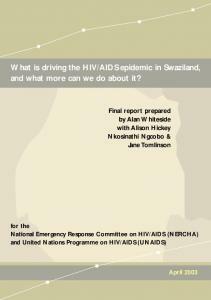 AIDS epidemic in Swaziland, and what more can we do about it? Myths of Migraine: What is it? Who gets it? What can you do about it? Ventilator-Associated Pneumonia: What can we do to prevent it? Ocean Conservancy promotes healthy and diverse ocean ecosystems and opposes practices that threaten ocean life and human life. Through research, education, and science-based advocacy, Ocean Conservancy informs, inspires, and empowers people to speak and act on behalf of the ocean. In all its work, Ocean Conservancy strives to be the world’s foremost advocate for the ocean. In partnership with volunteer organizations and individuals across the globe, Ocean Conservancy’s International Coastal Cleanup engages people to remove trash and debris from the world’s beaches and waterways, to identify the sources of debris, and to change the behaviors that cause marine debris in the first place. We are all connected to the ocean. The disheartening amount of trash afloat in the sea, littering beaches, and piling up on the sea floor affects the health of Earth’s life support system, the ocean, and all the living things in it. Marine debris is more than a blemish on Nature, it is a potential threat to our food supply, to tourism and economic activity, to marine wildlife and ecosystems, and to our personal health. It even relates to the impacts of climate change. But there’s good news: Marine debris is a problem we can readily solve. The ocean covers more than two-thirds of our planet. tourists, and choked ocean ecosystems. generated by a world population approaching seven billion. But our ocean is sick, and our actions have made it so. To keep the circle of life intact and healthy, we must act now. may affect our own health and well-being. more resilient to the negative impacts already set in motion by excess carbon dioxide in the atmosphere and seawater. indifference is proving deadly for our ocean’s inhabitants. everyone, everywhere in the world, can adopt and join in. we do makes a difference, all of our choices have consequences. do something, to not only be ardent advocates of conservation but also its most active participants. weather events are affecting marine life and coastal communities right now as you read this, not tomorrow or next year or decades from now. Removing marine debris is one way we can all take action to help the ocean adapt and become stronger in the face of climate change. But the problem of marine debris goes deeper still. While climate change and other stressors are taking a toll, trash layers the ocean floor, floats in our waterways, and harms and kills ocean wildlife, further weakening the system. blown on the wind or carried along by rivers and streams. recycling efforts in communities large and small. buoyant, traveling thousands of miles on ocean currents. for the survival of marine life. third Saturday of every September. This year’s report, A Rising Tide of Ocean Debris, presents data recorded by nearly 400,000 volunteers in 104 countries and locations and 42 US states at the 23rd annual Cleanup. and its connection to the challenge of global climate change. ing the behaviors that cause it, and supporting better policy. contained if people dispose of them carefully. source in addition to cleaning up what’s already out there. based on the bounty of the sea. the National Research Council recommended a goal of discharging zero waste into marine environments. warming water, and changing ocean chemistry. As marine organisms and ecosystems struggle to adapt to climate change, we can improve their resilience and help to give them a fighting chance by eliminating the stresses caused by human impacts like trash in the ocean. environmentally friendly materials. Support the inclusion of comprehensive ocean management in all climate change initiatives. Citizens must vote for and actively support climate change policies that protect the ocean. foundations, and non-governmental organizations in the environmental arena and helped shape change as never before. We must find every opportunity to pull all stakeholders into solution scenarios. and empowering individuals to support a healthier, more resilient ocean. and the District of Columbia, collected an astonishing 6.8 million pounds of debris, the equivalent of 17 pounds for every participant. 11,439,086 million pieces of trash, from cigarette butts to than 400 pounds of debris for every mile of beach cleaned. From families and friends to students and scout troops, devoted volunteers banded together and got down to work. that picture, item by item. number of any of the other 43 debris items tracked. Considering that the average person in the US generates more than four pounds of trash every day, the total amount of marine debris collected in the Cleanup could be equated to the daily trash of 1.5 million Americans. trips, picnics, sports and recreation, and festivals. as the top source of marine debris. Litter washes into the ocean from streets, parking lots, and storm drains. such as oil drilling contribute to marine debris. to keep these items out of the ocean in the first place. The total weight of garbage collected (3,402 tons) matches the weight of 18 blue whales, the largest whale in the world. industrial garbage, construction materials, or large household appliances puts big quantities of harmful items into the ocean. • Medical/Personal Hygiene. Items ranging from tampons and disposable diapers to syringes enter the water most often through sewer systems. cleanup in the US, with one out of five volunteers nationally. Mark you calendar for the next International Coastal Cleanup on September 19, 2009. Visit www.coastalcleanup.org to sign up. rash travels. A plastic bag carried from a store in Memphis, Tennessee, blows from a picnic table, washes down a storm drain to the river, and winds up being eaten by a sea turtle in the Gulf of Mexico (see photos at right). That’s why the International Coastal Cleanup takes place on lakes and inland waterways as well as the ocean’s shores. Data from the Cleanup confirms that the same items that litter the landscape show up on the ocean’s shores. Cigarettes/ cigarette filters were the number-one debris item removed from both coastal (2,447,482 butts) and inland (769,509 butts) cleanups. With 73 percent of volunteers in coastal areas, compared to just 27 percent inland, the International Coastal Cleanup hopes to enlist more volunteers to help clean up lakes and inland waterways. The Environmental Protection Agency, a key Cleanup partner since the start, understands the land-to-sea connection. The EPA-funded report National Marine Debris Monitoring Program: Final Program Report, Data Analysis and Summary estimates that in the US more than half of all marine debris originates from land-based activities. The trash collected during the 2008 Cleanup illustrates the scope of the hazards faced every single day by wildlife in the ocean. Marine debris not only entangles marine life, but injures and kills animals that eat it. Volunteers discovered 443 animals and birds entangled or trapped by marine debris, of which 268 were found alive and released. Fish, including sharks, stingrays, and seahorses, were the most prevalent (44 percent); volunteers found abandoned traps stuffed to the gills with doomed fish, and sharks tangled in rope or old nets. Invertebrates like octopuses, crabs, lobsters, and jellyfish were the second largest category, and birds came in third. Fishing-related items, including line, nets, rope, hooks, and crab/lobster/fish traps, accounted for the most entanglements: 69 percent, or three of every five animals found. For the complete Marine Debris Index go to page 34.
drums, cast-off motor-oil bottles and paint cans, rusting cars and household appliances, and many other items we dump into the sea affect not only wildlife but also the ecosystems they depend on for food, shelter, and the rearing of young. And when toxic materials from marine debris get into the seafood supply they may compromise human health. the most remote places. To protect wildlife and ourselves, we have to stop marine debris at its source. Every year, thousands of marine mammals, sea turtles, seabirds, and other animals are injured or killed by encounters with dangerous items we’ve carelessly allowed to reach the ocean. A fatal attraction to items like plastic bags, cigarette butts, and discarded fishing line and gear poses great hazards to the health of marine life throughout the ocean. Many species, like Hawaiian monk seals (see photo on page 16) that number just 1,200 today, are already critically endangered, raising the stakes when it comes to the impacts of marine debris. Ingesting Marine Debris: The Unhealthiest Diet Many birds, dolphins, seals, turtles, and fish eat things they shouldn’t—like bottle caps and toothbrushes. Few can regurgitate unhealthy items, resulting in a false sense of fullness that causes them to stop eating and slowly starve to death. Ingested trash can also cause choking, blockage of the digestive system, or toxic poisoning. Thousands of marine mammals, sea turtles, and seabirds are injured or killed because of encounters with dangerous items. on Dutch beaches revealed that 98 percent had plastic in their stomachs. • In Florida, 12 stranded dolphins had fishing gear in their stomachs, mouths, or throats, and some had line tangled from their stomachs to their mouths. by the smallest marine life at the base of the food web. abandoned ropes or fishing nets entangle them underwater. plastic pellets, bottle caps, string, and cigarette butts. impact not only wildlife but also our food supply. discarded fishing nets and rope, becoming entangled. around until they weaken and die. and streams, and even on the wind. of coral the nets had broken off and scooped up. crabs, lobsters, and octopuses become fatal prisons. and interactions between predators and prey. dollars lost in our tourism and fishing industries. change. As the engine that drives our planet’s climate, the ocean is on the front lines of climate change. It absorbs half of the carbon dioxide (CO2) we’ve pumped into the sky from the burning of fossil fuels and most of the extra heat produced by the greenhouse effect. Indeed, the ocean is the unsung hero in this battle. But it’s also a most vulnerable victim. percent in the last 175 years, and the increase is accelerating. by the Congress and the Obama administration. that threatens the future of ocean ecosystems and life. Marine debris is one of the straws that together could break the camel’s back—in this case, the ocean’s health. ocean will be a more resilient ocean. Think of the human body. When attacked by disease, its resistance and ability to recover from other stresses and diseases is diminished. Just as a person with emphysema or pneumonia would be less likely than a healthy person to survive working in a coal mine, an ocean compromised by many ills is less likely to survive the challenges of climate change. by coastal development all reduce the ocean’s resilience—its ability to resist and recover from stresses. From wildlife like endangered sea turtles and the Hawaiian monk seal to biologically-rich ecosystems like coral reefs, life in the ocean will be healthier, more resilient, and better able to adapt to climate change in the absence of debris-related impacts. knows no boundaries, and the United States has an unequaled opportunity to lead global climate change policy, including at the United Nations Climate Change Conference in Copenhagen in December 2009, where we can boost the odds that we will all be able to adapt to a world made vastly different from the one we have known. For more information, including the Congressional testimony noted above, visit www.oceanconservancy.org. marine debris to help protect this fragile population. healthier in the face of climate impacts. the fossil fuels we burn and changes in land management. Adaptation (natural) The response of a biological or ecological system to environmental changes brought about by climate change. adaptation (social) Any response by humans to climate change in order to reduce the negative impacts on communities, society, and economies. ecological resilience A measure of how much stress an ecosystem can stand from pressures natural or manmade without undergoing fundamental changes that may be permanent and, from a human perspective, highly undesirable. land, and overfishing. Scientists predict that if carbon emissions continue unabated, temperature rise and ocean acidification may lead to the death of most coral reefs worldwide during this century. If any reefs do survive, they will be the most resilient ones. It is our responsibility to ensure they are as healthy as possible to face the future. Marine debris compromises coral reef resilience by inflicting physical injury. Nets, plastic sheets, and other large forms of debris snag on coral reefs, breaking off living coral branches. Studies have revealed significant damage to delicate reefs by old fishing nets in the Northwestern Hawaiian Islands and Australia. Piles of trash block sunlight essential to the health of living coral. And toxic materials leaching from trash in the water poison these ecosystems. By removing and preventing marine debris, we are giving reefs a fighting chance at survival and they, in return, will continue to provide us with physical and spiritual nourishment that are critical to our health and well-being. The Great Pacific Garbage Patch Will Climate Change Create More Trash Dumps at Sea? magine the open ocean, emblematic of Nature’s wild and spectacular beauty, dominated by trash. Unbelievable, right? Guess again. That ugly picture is actually the reality in a significant portion of the North Pacific Ocean, where four major currents define a large area known as the North Pacific Subtropical Gyre, a giant eddy of sorts. In one particular hot spot north of the Hawaiian Islands, floating debris concentrates where ocean currents and wind meet (see convergence zone on map). This dynamic area of floating trash— everything from toys, boots, and balloons to tiny plastic particles—shifts location seasonally. Though many people call this area the “Great Pacific Garbage Patch,” that’s something of a misnomer; while not a solid patch of trash, it does encompass a huge amount of debris over a wide swath of ocean. Birds and animals across the region become entangled in this debris; their digestive tracts can become fatally clogged when they eat it. One researcher found that every one of 10,000 Laysan albatross chicks hatched in a year on nearby Kure Atoll had ingested plastic and other marine debris. The more trash we allow into the ocean, the more the concentration here grows year after year. The “Garbage Patch” is just one of several big accumulations of trash in the ocean. We don’t know how global climate change may affect them, but one possibility is that this one may shift closer to the Northwestern Hawaiian Islands, carrying more debris towards their beaches. And that could mean more entanglements of marine life like the endangered Hawaiian monk seal. the whole answer, because trash in the ocean is an on-going, year-round problem. Working together, we can change behaviors that lead to trash in the ocean, we can change laws to better govern litter and ocean dumping, and we can change to more ocean-friendly products through new technologies. Working together, we can solve the marine debris problem. opportunities to pull them into solution scenarios. for the long term. For instance, the National Oceanic and Atmospheric Administration, Schnitzer Steel Hawaii Corporation, Covanta Energy, and other public and private organizations all support the “Nets-to-Energy” program in Hawaii, which collects and burns lost fishing gear to get it out of the ocean and turn it into electricity. The program has been replicated in New England, where every ton of gear collected provides enough electricity to heat a home for 25 days. decisions with the ocean’s health in mind. cut its waste management costs by 25 percent. and wildlife ranging from the largest whales to the smallest sea snails. of stuff in our world. recycle just 33.4 percent of it. Reduce, reuse, recycle: The concept of going green starts with living blue. shapes have entered the scene. impacts climate change has on the ocean. biodegrade in water and soil, and compost readily. Seek better technological solutions to debris management and reduction. Sponsoring Partners us strengthen our online campaigns, expand our media reach, and increase awareness about the Cleanup and the problem of marine debris. Coca-Cola also has developed a campaign within the company to encourage participation in the Cleanup. In 2008, Coca-Cola engaged over 50,000 people in 35 countries across their worldwide system—company associates, bottling partners, customers, and consumers—to help clear beaches and waterways of debris. The Coca-Cola Company is a driving force and a strong partner in starting a sea change. keeping litter out of the world’s waterways all year long. kinds of solutions we need to fight marine debris. carbon footprint of the Gulf of Mexico shrimp fishery. that will pay dividends for years to come. and draw in members of the larger local community. The statements above recognize sponsoring partners who donate $50,000 or more to Ocean Conservancy to support the International Coastal Cleanup. For the complete list of sponsors, please see page 48. Japan Yoshiko Ohkura, Azusa Kojima Japan Environmental Action Network Edo Heinrich-Sanchez, Naoko Kiyan (Ryukyu Islands, Okinawa) Okinawa O.C.E.A.N. Kenya Fred Sewe Nairobi Keen Kleeners,Ltd. Alejandra López de Román (Tamaulipas) Club Regatas Corona, A.C.
Belize Bowen & Bowen Ltd. Protected Areas Conservation Trust (PACT) Augusto Quan Ltd. James Brodie & Co. Ltd. Jofius Ltd. Belize Audubon Society Belize Waste Control Ltd.
Thailand (Krabi Province) Thomson Reuters Thailand Food Star Co. Ltd. Fujitsu Systems Business Ltd. Haad Thip Public Co. Ltd. Hewlett-Packard Ltd. Infonet Co. Ltd. Plan Creations Co. Ltd. Siam Commercial Bank Public Ltd. The Siam Cement Public Co. Ltd. Toyota Motor Thailand Co. Ltd. Industrial Estate Authority of Thailand The Siam Cement and Dow Chemical Group of Join Venture Companies (SCG-Dow Group) (Rayong Province) Star Petroleum Refining Co. Ltd. Synthetics Company Ltd. HMC Plymers Company Ltd. Bangkok Industrial Gas Company Ltd. PTT Public Company Ltd. PTT Aromatics and Refining PCL INEOS ABS (Thailand) Co. Ltd. Peroxythai Company Ltd. Tourism Authority of Thailand Bayer Thai Co. Ltd.
OSG Ship Management Manila Inc. Department of Environment and Natural Resources Quezon City Government Rotary Club of Batangas First Gas Power Corporation/First Generation Corporation Batangas Coastal Resources Management Foundation Chevron Philippines First Philippine Conservation Inc Philippine Amusement and Gaming Corporation San Miguel Corporation Coca Cola Bottlers Philippines Inc.
ohn Kieser logged more than 18,000 miles driving across South Africa last year for Cleanup-related meetings, from the Orange River to the province of Kwazulu-Natal. His dedication to the job of Cleanup Coordinator began while he was working for the South African government. When John left the Department of Environmental Affairs and Tourism three years ago, the plastics and waste industries along with retail grocery chain Pick n Pay asked if he would make sure the Cleanup continued, both on the coast and inland—and so he has, with boundless enthusiasm needed for such a big job. Cape Town alone produces more that 3.5 million tons of waste annually, he says, and recycling is not yet widespread. “The beaches are in terrible shape from litter,” he observes. John enjoys the fact that the Cleanup revolves around a very positive atmosphere of community involvement. Restaurant owners who observed hard-working volunteers invited them in at day’s end for refreshments. When the ferry to Robben Island broke down, a local charter company stepped up to offer a large boat to transport volunteers, and they’re already onboard for next year. School children—for whom water pollution is part of the curriculum—flock to Cleanup sites every year. Companies sign up their entire staffs. And John points out that the Cleanup has influenced other exciting programs. Thirty-eight schools on the western Cape are involved in beach monitoring through an Adopt-a-Beach program, and John helps raise litter awareness at major sporting events like the annual Argus-Cape Town cycle tour. A government anti-poverty program pays poor people to clean up litter. But none of this progress could happen without the energy and ideas of coordinators like John. The Marine Debris Index The Marine Debris Index presents state-by-state and country-by-country data about marine debris collected and tallied by volunteers around the world on one day each September at the International Coastal Cleanup. Methodology and Research Notes Ocean Conservancy, in conjunction with its US and international volunteer coordinators, has collected data during the International Coastal Cleanup since 1986 within the US, and since 1989 internationally. From 1986 through 2000, Cleanup volunteers tallied debris items on standardized data cards developed and provided by Ocean Conservancy. During this time, debris was categorized by the type of material. In 2001, Ocean Conservancy revised and simplified the data card to include 42 specific debris items and groupings related to five debris-producing activities and sources. The new groupings identify the behavior associated with the debris’ presence. In 2008, Ocean Conservancy decided to tally paper and plastic bags separately for a total of 43 items listed. Totals for each site are mailed, emailed, and faxed to Ocean Conservancy, or are entered into Ocean Conservancy’s secure Online Data Collection and Reporting Tool by the Cleanup coordinator for the country, location, or US state. All data sent to Ocean Conservancy and not entered online by the coordinator are entered into the online tool by Ocean Conservancy staff. The result is a unique global, online database of debris information collected from Cleanup sites around the world. Limitations of the Data Data are collected on a single day by volunteers—not by paid staff or researchers—in more than 6,485 sites and locations around the world. Ocean Conservancy produces data cards in six languages; there could be a language barrier for some volunteers. Data for pounds and miles are sometimes estimated by volunteers (see terminology). The data represented in this report are only what was shared with Ocean Conservancy, and totals could be higher if all locations reported in. Weather events can impact planned events and may decrease data return for a certain country, location, or US state. Interpretation of the Data The collected data is a snapshot of what was removed from a certain location, on a certain day, by volunteers. The data provide the most comprehensive and measurable global snapshot of the world’s marine debris, as well as a breakdown of sources and debris items found in US states, countries, locations, and regions of the world. Due to the large sample and nature of the collection, the data provide a base for other studies. This valuable information is an effective tool for educating the public, business, industry, and government officials about the presence of marine debris and how and where to take specific actions. but is located in a different geographic area than the governing country (for example, the Netherlands Antilles are governed by the Netherlands, but are located in a different geographic area than the governing country). These geographic designations do not imply Ocean Conservancy’s opinion of the legal status of any country, territory, or location (including islands), or concern the delimitation of its boundaries. Terminology Below are the definition of terms used throughout the report: The Symbol (-) in a Chart This data was not collected. The Number 0 in a chart The quantity of the data collected was equal to zero. Coastal Cleanup This type of Cleanup site borders the ocean. Inland Cleanup This type of Cleanup site borders waterways that are located inland such as rivers, lakes, streams, and ponds. It is not located on the ocean. Land Cleanup A Cleanup that was conducted on a beach or waterway. Underwater Cleanup A Cleanup that was conducted underwater by certified divers. Watercraft Cleanup A Cleanup that was conducted offshore by watercraft which includes kayaks, canoes, sail boats, and motor boats. People or Volunteers The number of people or volunteers at a Cleanup site are counted by the coordinator, totaled for each country, location, or US state, and sent to Ocean Conservancy. Pounds Volunteers weigh trash collected when possible. On average, a bag of trash weighs 15 pounds, an estimate which is used by coordinators and Ocean Conservancy staff to estimate weight if scales are not available. Miles The number of miles cleaned is estimated from the starting point to the end point at each Cleanup site. The distance for a Cleanup site is not the sum of all distances covered by each individual volunteer. Volunteer for Ocean Conservancy’s International Coastal Cleanup held every September. Go to www.coastalcleanup.org. Put trash in a secure, lidded receptacle—most marine debris starts out on land. Properly recycle everything you can: batteries, cans, bottles and food containers, newspapers, cell phones, computers, bags, packaging materials, fishing line. Contact your local waste hauler or county solid waste office to discover your recycling options. When boating, bring your oil cans, food wrappers, and cigarette butts back to shore, and be sure to ask your marina to handle waste properly (check out Ocean Conservancy’s Good Mate manual for helpful tips at www.coastalcleanup.org). Less is more: Don’t buy stuff you don’t need that will just end up as trash. When you do make purchases, choose items that use less packaging. Start conversations that inform and inspire your friends and co-workers to help stop marine debris at the source. Bring along your own permanent food containers for picnics instead of using disposables. Remember to take your own reusable bags whenever you go shopping. Write to companies or visit local shops and restaurants and encourage them to reuse, recycle, and generate less packaging. Put cigarette butts in ashtrays, not on streets, sidewalks, or beaches. Write to your elected officials and encourage them to support policies that protect our ocean. For more information or to sign up as a volunteer for the next International Coastal Cleanup visit www.coastalcleanup.org. Sources “Big City, Big State, Big Results: Fort Worth, Texas, Adopts PAYT.” US Environmental Protection Agency PAYT Bulletin, Spring 2004. Brown, J., G. Macfadyen, T. Huntington, J. Magnus, and J. Tumilty. 2005. “Ghost fishing by lost fishing gear.” Final Report to DG Fisheries and Maritime Affairs of the European Commission. Fish/2004/20. Institutue for European Environmental Policy/Poseidon Aquatic Resource Management Ltd. joint report. Bullimore, B.A., P.B. Newman, M.J. Kaiser, S.E. Gilbert, and K.M. Lock. “A study of catches in a fleet of ‘ghost fishing’ pots.” Fishery Bulletin 99: 247-253 (2001) “Coral Reefs Under Rapid Climate Change and Ocean Acidification.” O. Hoegh-Guldberg, et al . Science 318, 1737 (2007). Damerona, O.J., M. Parke, M. Albins, and R. Brainard. 2007. “Marine debris accumulation in the Northwestern Hawaiian Islands: An examination of rates and processes.” Marine Pollution Bulletin 54: 423-433. Derraik, Jose. “The Pollution of the Marine Environment by Plastic Debris”: A Review.” Marine Pollution Bulletin 54 (2007): 423-433. M.J. Donohue, R.C. Boland, C.M. Sramek and G.A. Antonelis (2001). Derelict Fishing gear in the Northwestern Hawaiian Islands: diving surveys and debris removal in 1999 confirm threat to coral reef ecosystems. Marine Pollution Bulletin 42 (12): 1301-1312. Intergovernmental Panel on Climate Change. 2007. Fourth Assessment Report: Climate Change 2007. Contributions from Working Groups I (The Physical Science Basis), II (Impacts, Adaptation and Vulnerability), and III (Mitigation of Climate Change) and the Synthesis Report to the Fourth Assessment Report of the Intergovernmental Panel on Climate Change (IPCC). Cambridge University Press, Cambridge, United Kingdom, and New York, NY, USA (http://www.ipcc.ch, accessed November 19, 2007). “Long-Term Region-Wide Declines in Caribbean Corals.” Toby A. Gardner, et al. Science 301, 958 (2003). McDermid, K.J. and T.L. McMullen. 2004. Quantitative analysis of small-plastic debris on beaches in the Hawaiian archipelago. Marine Pollution Bulletin, 48(7-8):790-794. “Municipal Solid Waste in the United States: 2007 Facts and Figures.” US Environmental Protection Agency Office of Solid Waste, November 2008. Myers, Andy. “What Comes Around: Breaking the Cycle of Plastics in the Ocean.” Ocean Conservancy, Autumn 2007. National Research Council (2008) “Tackling Marine Debris in the 21st Century.” Committee on the Effectiveness of National and International Measures to Prevent and Reduce Marine Debris and Its Impacts. Nellemann, C., Hain, S., and Alder, J. (Eds). February 2008. “In Dead Water – Merging of climate change with pollution, over-harvest, and infestations in the world’s fishing grounds.” United Nations Environment Programme, GRID-Arendal, Norway, www.grida.no O’Hara, K.J., S. Ludicello, and R. Bierce. A Citizen’s Guide to Plastics in the Ocean: More than a Litter Problem. Washington, DC: Center for Marine Conservation, 1988. Ryan, P.G. 2008. Seabirds indicate changes in the composition of plastic litter in the Atlantic and south-western Indian Oceans. Marine Pollution Bulletin, 56(8): 1406-1409. Schreiber, Allan. “Dead Sperm Whale Washes Ashore.” Upwelling. Farallones Marine Sanctuary Association, April 2008. Skumatz, L. et al. “Pay as You Throw in the US: 2006 Update and Analysis: Final Report.” Prepared for US Environmental Protection Agency and SERA by Skumatz Economic Research Associates, Superior, Colorado, December 2006. Sheavly, S.B. 2007. “National Marine Debris Monitoring Program: Final Program Report, Data Analysis and Summary.” Prepared for US Environmental Protection Agency by Ocean Conservancy, Grant Number X83053401-02. 76 pp. Stamper, Andrew. “Case study: Morbidity in Pygmy Sperm Whale Kogia breviceps due to Ocean-Bourne Plastic.” Marine Mammal Science 22(3) (July 2006):719-722. van Franeket, J.A., A. Meijboom, M.L. de Jong. “Marine litter monitoring by Northern Fulmars in the Netherlands 1982-2003” Alterra, 1093, Wageningen. Waddell, J.E. and A.M. Clarke (eds. ), 2008. The State of Coral Reef Ecosystems of the United States and Pacific Freely Associated States: 2008. NOAA Technical Memorandum NOS NCCOS 73. NOAA/NCCOS Center for Coastal Monitoring and Assessment’s Biogeography Team. Silver Spring, MD. 569 pp. UNEP-CAR/RCU, 2008. Marine Litter in the Wider Caribbean Region: A Regional Overview. United Nations Environment Programme. 81 pp. Wells. R.S., J.B. Allen, S. Hofman, K. Bassos-Hull, D.A. Fauquier, N.B. Barros, R.E. DeLynn, G. Sutton, V. Socha, and M.D. Scott. 2008. “Consequences of Injuries on Survival and Reproduction of Common Bottlenose Dolphins (Torsiops truncates) along the West Coast of Florida.” Marine Mammal Science 24(4): 774-494. Wilkinson, C., Souter, D. (2008). “Status of Caribbean coral reefs after bleaching and hurricanes in 2005.” Global Coral Reef Monitoring Network, and Reef and Rainforest Research Centre, Townsville, 152 p. Zabin, C.J., J.T. Carlton, and L.S. Goodwin. 2004. “First report of the Asian sea anemone Diadumene lineata from the Hawaiian Islands.” Bishop Museum Occasional Papers, 79:54-58. Each year, Ocean Conservancy—in partnership with a network of volunteer organizations and individuals— provides a compelling global snapshot of marine debris collected in and around the ocean and inland waterways all over the world on the third Saturday in September. This year’s report, A Rising Tide of Ocean Debris, presents data recorded by nearly 400,000 volunteers in 104 countries and locations and 42 states and the District of Columbia in the US who rolled up their sleeves and got to work during Ocean Conservancy’s 23rd annual International Coastal Cleanup. In addition to providing the Marine Debris Index—state-by-state and country-by-country data about the 6.8 million pounds of trash picked up—this report reveals the sources of debris, from cigarette butts and fast-food wrappers to syringes and old fishing line, and zeroes in on the deadly effects of marine debris on marine wildlife. It also identifies the connection between the stress caused by marine debris and the ability of the ocean and its critical-life support systems to adapt to the onset of global climate change. Recommendations provide a roadmap for eliminating marine debris altogether by reducing it at the source, changing the behaviors that cause it, and supporting better policy. Humans have created the marine debris problem, and humans must take responsibility for it. The comprehensive body of data compiled during the Cleanup in the course of its 23-year history continues to inform and inspire action. Working together, citizens and environmentalists, our top corporations, and government leaders can take effective action to eliminate the scourge of trash in the ocean. The future of the planet and the well-being of present and future generations are counting on it. Report "And What We Can Do About It Report"